Does anyone remember when I used to buy a new nail varnish each week? I now have quite the hefty collection. So much so that I had to stop buying it as I ended up just buying dupes of dupes of nail varnishes that I already owned. Luckily, I recently managed to find a nail varnish that I haven't owned in one way or another. The best bit? It was £1.99. In my local Boots store was a stand of Seventeen's Colour Carnival Nail Varnish which has 60 different shades and varieties. I stood and uhhm-ed and ahh-ed for about 15 minutes. The variety and possibility was too much for me to handle so I haphazardly chose 2 nail varnishes. The first one being Purple Glitter. Purple Glitter is a purple based varnish with small, tiny particles of irredescent glitter running throughout. It is a really beautiful nail varnish and it's a shame as my photos do it no justice at all. Purple Glitter applies pretty sheer so a good few layers are needed for each nail. In the photos above I applied 3 layers but I think I may have needed an extra layer, just to get a deeper base colour. As nail varnishes go, this one dried pretty quickly and I didn't manage to smudge it either which is a great surprise to us all! Overall, a really cheap nail varnish which needs a good few layers to build up colour but once it's there, it packs a punch. For £1.99 you can't really go wrong and as there are 60 shades, there is bound to be something to suit everyones tastes. Autumn is all about bronzey eye make-up and berry lips. But what about the other way round? What about berry eyes and bronzey lips? I've got the berry eyes covered. Enter MAC Eyeshadow in Cranberry. I bought this a very long time ago, left it in my cupboard and forgot all about it. When I had a very much needed sort through my make-up last week I rediscovered it and plucked up the courage to use it - and guess what? It's a bit of a dream. Cranberry is a beautiful deep raspberry with a subtle shimmer which can look a little intimidating in the pan. It is rather bright when applied so I know a lot of people apply it with other eyeshadows in order to tone down the colour a little but I decided to test it out on it's own. After applying my beloved MAC Painterly Paint Pot all over my eyelid as a primer, I then applied Cranberry using a flat ELF eyeshadow brush. It is wonderfully easy to apply and is beautifully soft in the pan. I really expected a lot of fall out from this eyeshadow and expected to have to re-do my foundation afterwards but hardly any of it fell out which is great and pleasantly surprising! Like I thought, Cranberry applies very bright and vibrant on the eyelids. I applied two layers of it to get maximum, vibrant colour then applied a little bit underneath the eye too. I instantly fell in love with the results and although I won't be wearing Cranberry on it's own everyday to work, I reckon it would work wonderfully well paired with another eyeshadow to tone it all down a little bit. I wore Cranberry for about 8 hours and it didn't wear or fade at all although I was wearing Painterly underneath. Like all of MAC's other eyeshadows, it is a beautiful vibrant cover which is a dream to apply. I will definitely be wearing Cranberry throughout the Autumn! I have been meaning to write this post for so long. I'm really struggling with motivation to blog at the moment. I can manage to get words into sentences but not necessarily in the correct order. I bought this face scrub so long ago I can't remember when. At the time my skin was in terrible condition, I had awfully dry skin and spots galore. I took a trip to Boots to try and find a solution and whilst I am yet to find a remedy for spots, this product is quite good for my dry skin issue. I bought the Botanics All Bright Purifying Face Scrub for a couple of pounds when it was on offer, which it often is. I really love the Botanics range in Boots so it's always worth having a little look when you are in there as they do sell some gems! "This cleansing scrub contains refining walnut shell to buff away flaky skin while crushed apricot seeds gently sweep away impurities. Enriched with brightening hibiscus, it is suitable for all skin types." "Apply to skin after cleansing, gently massage with your fingertips using light circular movements." The face scrub comes in a standard plastic squeezy tube where the product is easy to come out of. The first noticeable point to this face scrub is the smell - it smells great! I couldn't point out what it smelt like but after reading about the crushed apricot seeds I definitely think that there is a lovely, subtle hint of apricot in there somewhere. It's a very fresh, light scent and is pretty much inoffensive. After squeezing a 50p piece sized amount into my hand, I applied the face scrub by following the directions and the face scrub foamed up nicely and felt rough on the skin. When I use face scrubs I really want the scrubby bits to be really rough in order to do the job nicely and although the walnut particles in this scrub are rough, they could be a little harsher. Regardless of this, my skin was left feeling a lot smoother and softer than before and any dry skin had gone, which is what I had hoped for. My skin is also left looking a bit brighter and perkier which is just what you need when you're feeling and looking a little bit grey! Overall, a really pleasant and inexpensive face scrub. It does the job well and removes any dry skin whilst leaving the skin feeling softer and looking a bit brighter. It doesn't make the skin feel tight at all which is what I have found with a few other face scrubs and the scrub itself smells lovely. If you are after a cheap face scrub then this is great! I'm gonna let you all into a little secret.. 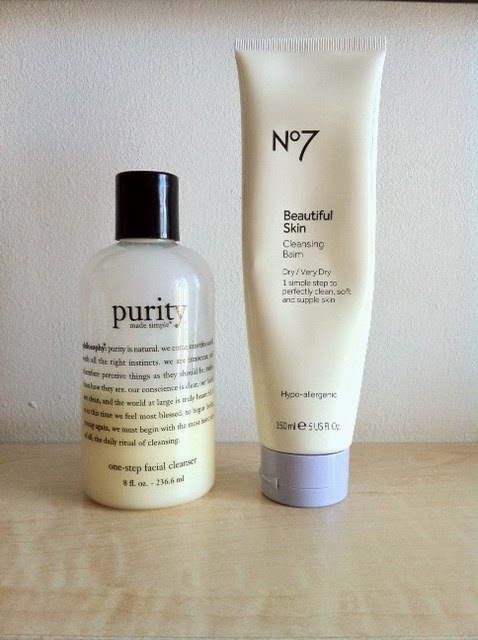 I am really lazy when it comes to my skincare regime. When I was younger, my outlook on it would be "I wake up, I have skin" but now I am trying to change my ways, especially since I'm not 14 years old anymore. Times a tickin' and wrinkles are already a worry for me. Perhaps I will get wrinkles due to worrying about wrinkles? I'm slowly trying to get myself into a routine of cleansing, toning and moisturising daily using exfoliators and face masks a couple of times a week too. I'll be honest and say that some days I just can't be bothered and end up missing a couple of steps out - luckily nothing terrible has happened because of this. Oh, and I also use make-up wipes which is the ultimate sin I know but they are a matter of convenience and again, my skin hasn't changed for the worse since using them. I have a hoard of products which have taken over my bedroom and our family bathroom which I'm trying to use consistently in order to declare to everyone that I have a 'skincare routine'. All of the products I use are relatively cheap from drug stores and from the high street. A beautifully fresh scented gentle facial cleanser. It doesn't foam up too well but it feels lovely on the skin and is my go-to, everyday cleanser. A clean, creamy cleansing balm which is slightly thicker in consistency to Purity. It feels more luxurious than Purity which is odd considering it's half the price but I feel like my skin is completely clean and free of any dirt or make-up once I've used it. If I were to choose between the two above then this would be my preferred option. This is a great, cheap exfoliator. It takes a while to get it to foam up and it could do with a few more scrubby particles but it takes away any dry areas of the skin and does the job well. I do find that it leaves the skin feeling a little tight, however. Again, another really cheap exfoliator. I don't find the particles to be any rougher than the scrub above but it leaves my skin feeling much softer than the other. Neither of them are particularly amazing but they do the job. A much cheaper to an Origins Charcoal Mask, this mask does it's job well in removing impurities and deeply cleansing. Once it dries any impurities are revealed in the mask which are then to be drawn out. It sounds, and looks, utterly bizarre but it really works and leaves the skin looking clearer. It has an odd smell though. This is a lovely thick and creamy pale blue mask which dries to white once it's job is done. After washing off with warm water the skin feels soft but results aren't immediately visible. Again, another thick and creamy mask from Avon. This Pore Penetrating Mask is a light green in colour and dries white. Like the mask above, the skin is left feeling soft but results aren't immediately visible. 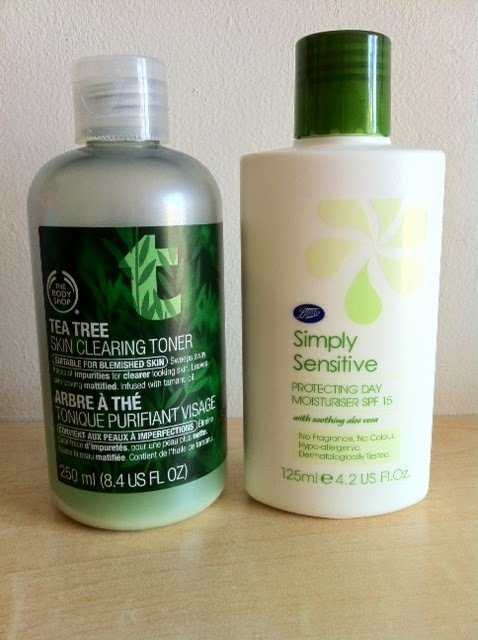 I think this was the first toner I ever bought and I still repurchase it, even now. It is gentle on the skin, really refreshing and takes off any remaining scraps of make-up. I find that some days it feels a little sore on the skin, almost like a burning sensation but I think that might be just me?! The Body Shop and Nivea toners are my faves. I really love this moisturiser. It is so light and refreshing - it is perfect for warmer months and perfect for mixing foundation into. I probably won't be using this moisturiser in winter, preferring something a bit more thicker and creamier in consistency to help with affects cold weather brings but this a definite summer fave. What are staples in your current skincare regime?